My first Master’s blog starts with the Installation Dinner, and the transfer of Mastership from Bryan Burrough, which is very well reported in the accompanying article by Emma Fox. It was a most memorable and enjoyable event. The first engagement for the Mistress and myself was an exhibition of the Woodturners craft, hosted by the Worshipful Company of Turners. Examples of work by Liverymen and craftsmen were on display, including live displays of woodturning. The famous artist Gabor Lacko was signing books of his work – a lifetime of artistry. His work “Russian Bells” proved too tempting. We left the exhibition poorer, but happy. Later that week, the Mistress and I were joined by the Clerk and Assistant Clerk for the “Swan Feast” at Vintners’ Hall as guests of the Master and Wardens. This is a splendid occasion which celebrated the right of Vintners to eat swan – a delicacy which was the preserve of the Monarchy from medieval times. Henry VIII conferred this honour on the Vintners, which is the focus of the celebration. A model feathered swan is presented to the Master by the chef during the dinner – accompanied by musicians playing medieval instruments and dressed as minstrels of the period. The next formal event was as a guest of the Worshipful Company of Parish Clerks, whose main event is the feast of St Nicholas, preceded by a church service at the St James Garlickhythe. The Feast took place in the sumptuous surroundings of the Grocers Hall. One original aspect of the Dinner is the ‘Cross Toasting’, where Liverymen all rise simultaneously to toast different individuals, shouting the name of their Parish. The result is a cacophony. A Liveryman in this Company must be a Clerk of a Parish in the City of London, or a handful of parishes in London outside the City. There are currently 89 Liverymen. I left the dinner to take the Caledonian Sleeper to Edinburgh for the Scottish Committee meeting the following morning. We granted the Freedom of the Company to 3 members of the Scottish Distilling Industry. Ken Grier, the driving force over the last 20 years behind much of the success of The Macallan, and Ian and John Stirling, the brothers who have established the Arbikie distillery near Montrose. 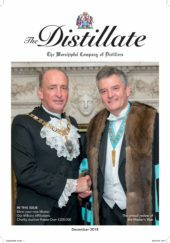 This was followed by the Whisky of Icons lunch held in Surgeons’ Hall in Edinburgh, hosted by Liveryman Damian Riley-Smith and Paragraph Publishing. Ken Grier received a Lifetime Achievement Award at the lunch. I was invited to make a short speech about the Livery and I was happy to congratulate the Scottish Committee for the strength of our thriving Scottish Membership. Probably unique among City Livery Companies, almost 20% of our active membership is based in Scotland. The following week, our Learned Clerk accompanied me to the Installation Dinner of the Master of the Glass Seller at Stationers’ Hall. Our Company and the Glass Sellers are members of the Cask Group – an informal association of Livery companies with a common interest in the drinking and hospitality trade. The group comprises of The Vintners, Brewers, Coopers, Glass Sellers, Innholders and ourselves. Our Distillers Carol Service and dinner last week was very enjoyable and it was wonderful to see so many Liverymen and guests singing heartfully, especially when our Learned Clerk led us all in a rendition of ‘We wish you a Merry Christmas’ to send us on our way. The next day at the Sanctuary the Wardens, Clerk and I granted the Freedom of the Company to David Croll of the Kyoto Gin Distillery in Japan. The Lord Mayor hosted a festive event at the Mansion House in the week before Christmas. It was a celebration of ‘Scrooge’ and a Christmas Carol with readings by Simon Callow, who is an enthusiast for Charles Dickens. As we entered the luxurious Egyptian Hall, drinks were proffered. At first glance, I thought it must be a very pale white wine or perhaps a glass of gin? After all, gin was very popular in Victorian times and taken neat. But on tasting it, imagine our surprise to discover it was water and the canapé which accompanied it was a water biscuit! The Lord Mayor was determined to create the right mood for an appreciation of the themes of Dickens’ Scrooge. But redemption, as for Scrooge, did appear after the readings when Champagne and canapés were served. Mark Dickens, the great great grandson of the author was also present. The Lord Mayor had made his point. The event was after all intended to support his Charity Appeal, including On Side Youth Centres to which we have contributed and some of whose members were present. We were delighted to purchase a bottle of the Lord Mayor’s Reserve, Cotswold English Whisky, produced by our Liveryman Daniel Szor, in support of the Lord Mayor’s Appeal. The Mistress and I would like to wish all Liverymen and their families a very happy Christmas and a most fulfilling and enjoyable New Year. As Tiny Tim said in A Christmas Carol – ‘God bless us, Every one’.